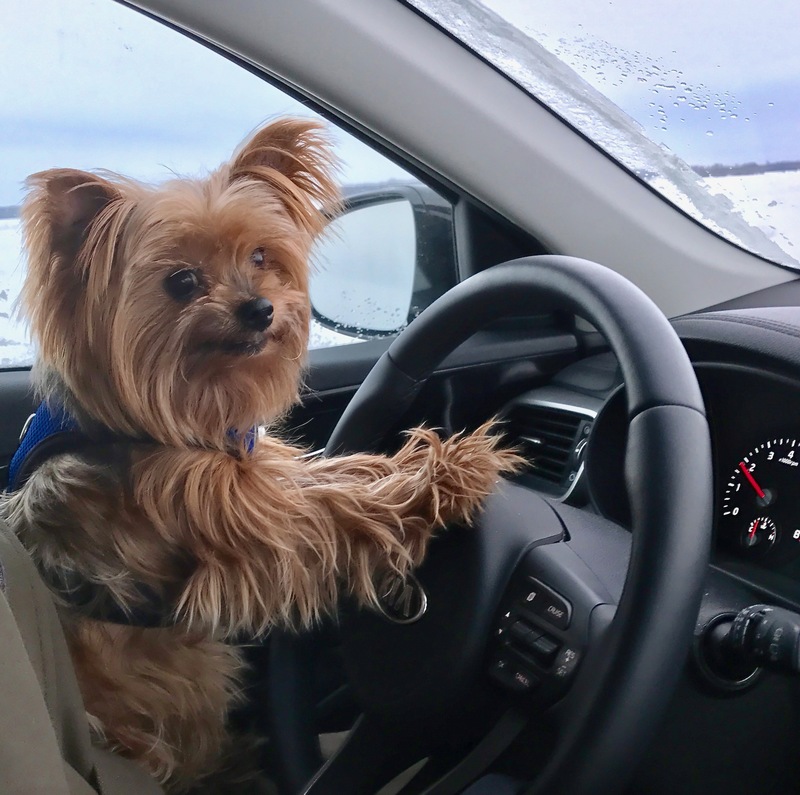 It was the summer of 2013 when a five-year-old Yorkshire Terrier cross with the cool name of Timbit was dropped off at the Humane Society in North Edmonton. Things didn’t look good for Timbit. The little guy was in bad shape. Yorkies are cute, but not this one. Much of Timbit’s fur was gone. His entire side was swollen; pus oozed from his blistered skin. The dog suffered from a skin condition that left large, bloody wounds — the result of nonstop scratching. The Edmonton Humane Society. [Photo credit: Carolyn] Click to enlarge. But thanks to a veterinarian who went beyond the call of duty, Timbit was granted a reprieve. 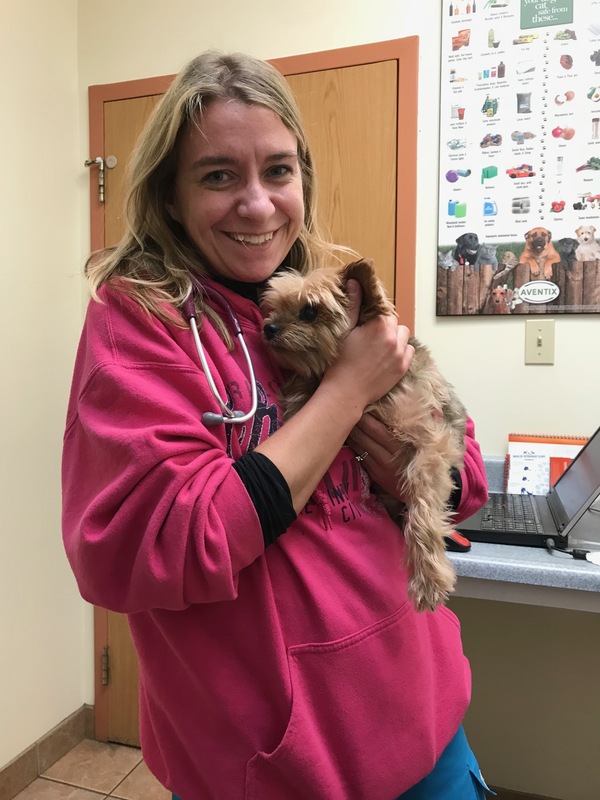 Doctor Melanie Bouclin put on hold his walk on the ‘Rainbow Bridge.’ The young vet gave Timbit emergency medical care, then put him on a strict diet. 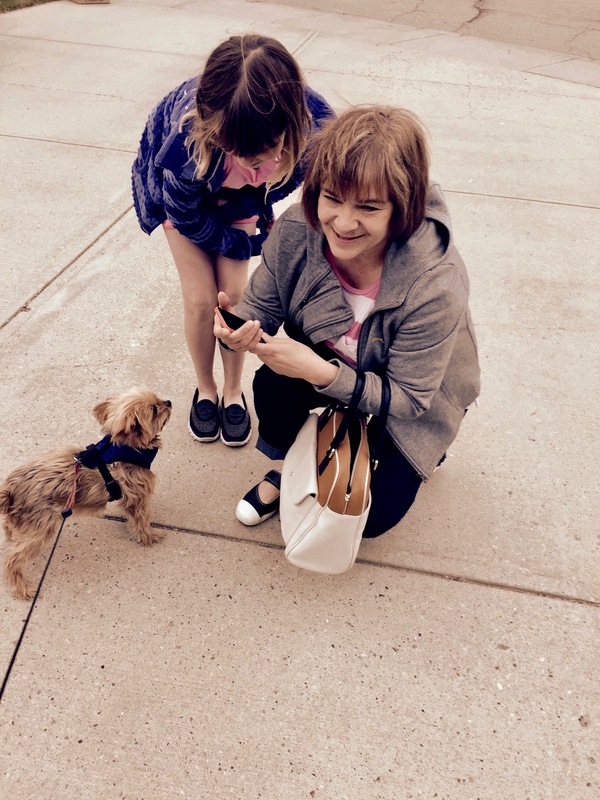 Dr. Melanie fell in love with the little dog. In spite of Timbit’s health problems, she felt he still had a future … and could bring joy to many. She just knew. The skinny on Timbit was that he was gentle, quiet and got along well with other dogs. He also got along well with humans — especially Dr. Melanie. Right then and there, the vet made it her goal to save him. And so began medical treatments. But progress was slow. Within a few months, Timbit was adopted and living the dream in a home in a new subdivision in the west-end of the city. 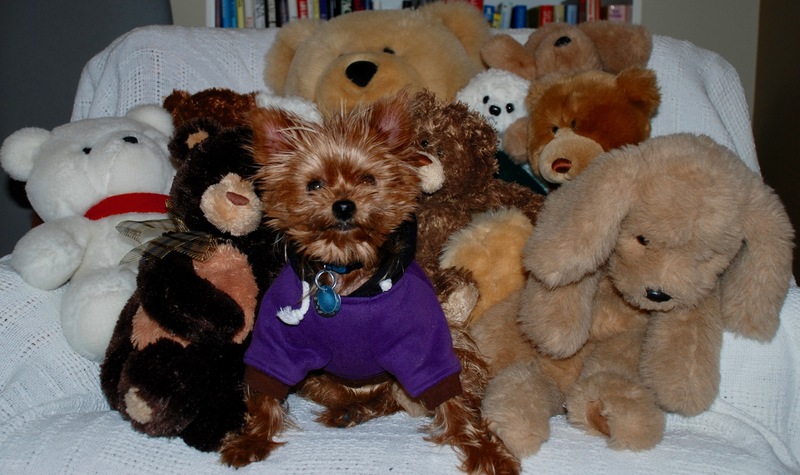 The Yorkie with the missing fur and the scratching problem was off Death Row and enjoying his second life. Timbit arrived with all his earthly possessions — a small circular bed that looked to be older than him, a blanket spotted with doggie logos, a body harness, a red vest and a leash. That was it. Oh. And some dog food. Timbit’s fur began to grow back and his scratching greatly diminished once he got the proper medicine and proper food. In this photo, taken in the fall of 2013, the pup was on the road to recovery. Click to enlarge. The Yorkie cross was a bit of a mystery. No one seemed to know where Timbit had lived before. 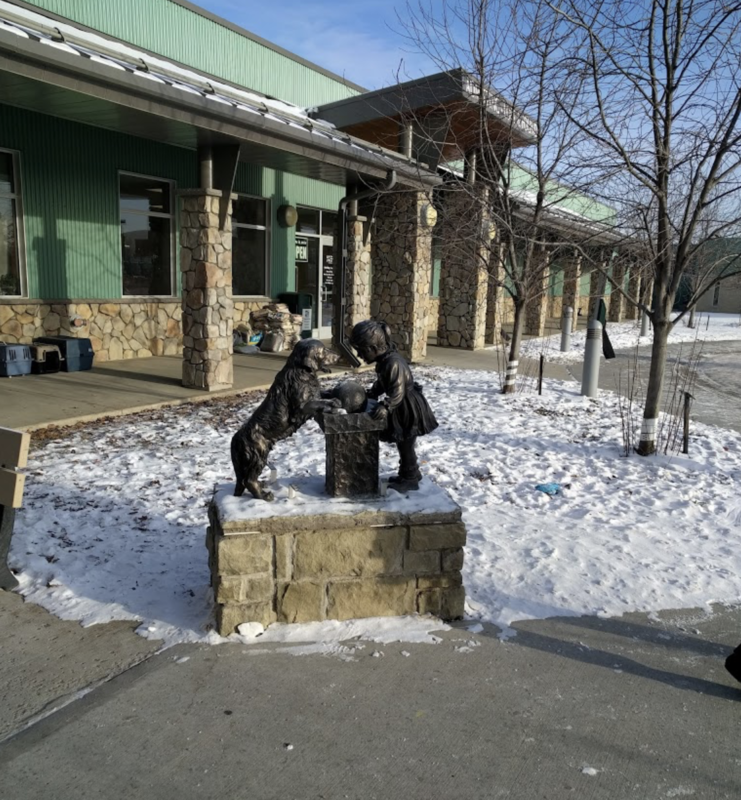 All the shelter would offer was that he came from a home in the northeast part of Edmonton — many miles away — and that a granddaughter was moving to Ontario and couldn’t look after him. Had Timbit’s original owner died? Your guess is as good as mine. The little dog knew the answer but wasn’t talking. Courtesy of cartoonist Adrian Raeside of the Victoria Times Colonist. Click to enlarge. 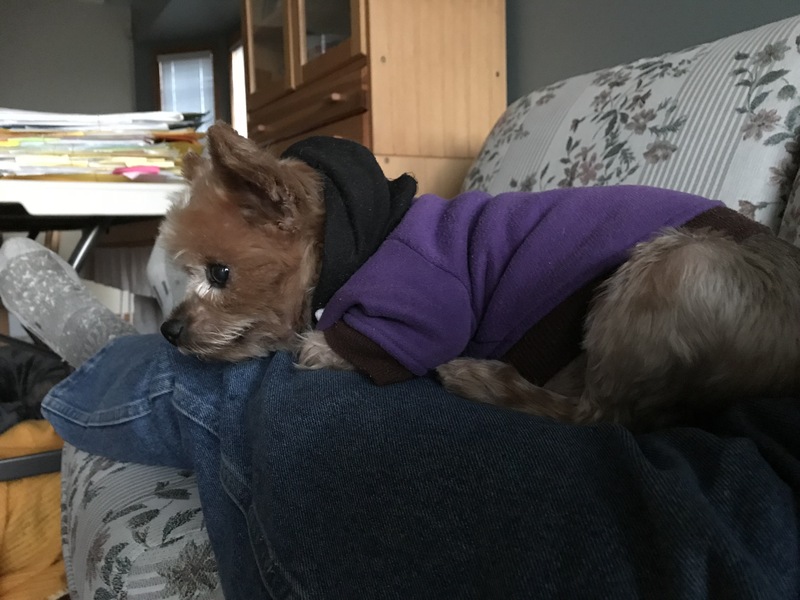 According to adoption papers from the Humane Society, Timbit was ‘house trained and crate trained.’ In other words, he was familiar with puppy pads … and had traveled about safely. If nature called, Timbit simply stood quietly at the door and glanced backward now and then, a signal he wanted out. How badly he needed out was shown in the number of times he danced and pawed at the door. The Yorkie’s first stroll in the backyard indicated he was a house dog. He ‘high-stepped’ on the lawn — an odd behaviour for dogs, even a small one. Timbit likely spent his first years in a high-rise [without shag carpet] because walking on grass was something new for him. Wild rabbits continued to hang out in the backyard but their visits declined when Timbit took a liking to sunning on the deck. He did a lot of that in the spring and in the fall. Here is Timbit’s nursing station at his new home. The dog was given more attention and better care than some people. Click to enlarge. When Timbit arrived, he didn’t bark. That was strange, and nice. Then it happened. It was a short woof and it came after he spotted a magpie on the deck. His deck. It took Timbit several months, but he had finally found his voice. Timbit then began barking when the doorbell rang. If no one went to the door immediately, ‘Timmy’ went into panic mode, dancing about, his toenails making a clickety clack sound on the wooden floor. As small as this guy was, he was protecting his turf. And like all dogs, Timbit was loyal. Timbit and his quiet friends. Click to enlarge. Timbit took over the house, sleeping wherever and whenever he felt. He had about 15 locations. [that’s not a typo.] Here’s one of his favourite hangouts — a furry foxhole. Click to enlarge. The short clip of a dancing Timbit became a favourite on CISN-FM’s Instagram page [CISN is one of the top radio stations in Edmonton.] DJ Randy Marshall posted it. Dr. Melanie pointed out something I hadn’t given much thought to — that rescued dogs show more appreciation than those from the puppy mills. That’s because they got a second chance at life and they’re forever grateful. In any case, dogs are always forgiving and full of unconditional love — but for the mutts who’ve been spared the gallows, there’s appreciation in spades. What was going through Timbit’s mind after he was left at the animal shelter? Why am I here? Where’s my owner? What’s happening to me? We can only imagine. How the little guy must have longed for his owner. The sad part is that Timbit hadn’t done anything wrong. Not a damn thing. He hadn’t bitten anyone, chewed up shoes or destroyed furniture. Timbit was on death row because someone couldn’t or wouldn’t care for him. And so they turned away. Strangers at an animal shelter would now decide his fate. Timbit’s darkest memories — and God only knows what they were — returned to haunt him. The dog whimpered in his sleep, obviously struggling with some grief or fear. He battled his demons. The same love Timbit had shown strangers was given to him in return. This is what happens when caring is a two-way street. Timbit wasn’t just like a family member. He was a family member … a living being with feelings and compassion. There’s a four-letter word for that: love. Timbit on his “master’s” lap. As soon as he laid down on the couch, up jumped Timbit [uninvited] to give him company. Click to enlarge. Timbit spends time with the neighbours — while they snap pictures. Click to enlarge. ‘Mr. Timbit’ finally got his learner’s permit. Cheeky smile. Click to enlarge. 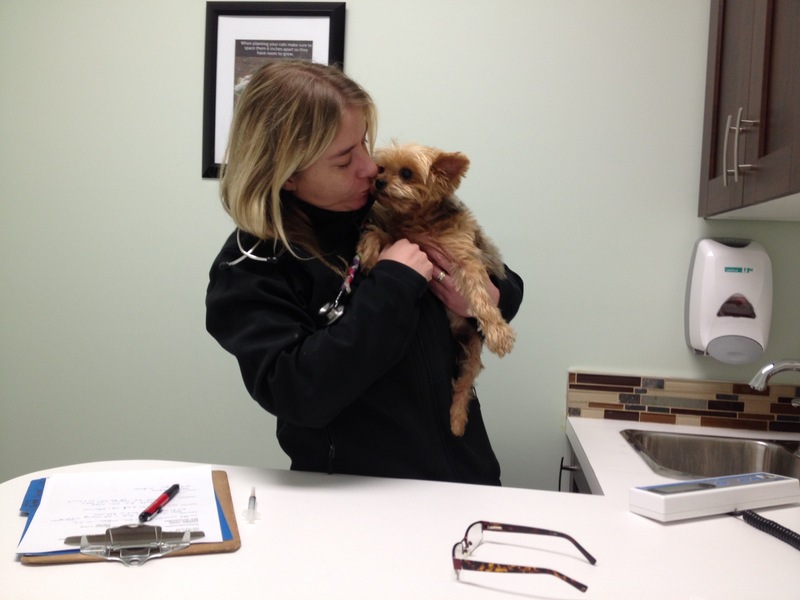 Dr. Melanie continued to see Timbit … sometimes at his new home, sometimes at her parents’ cottage — and at her clinic. Timbit was never happy to leave home to have his nails cut or fur clipped, or to drive to a clinic. That’s understandable because the dog never really knew where he was headed … and he wasn’t sure if he was coming back. The Yorkie cried, hyperventilated and just wouldn’t sit still. He trembled with fear. The way he carried on, you’d think the world was ending. I realize many dogs behave like this when they leave in a vehicle but I suspect Timbit’s behaviour was over the top because he’d been abandoned before. He was reliving something awful. A kiss for Timbit from Dr. Melanie. Click to enlarge. Timbit died suddenly Sunday afternoon, 22 April 2018. The pet who’d been nicknamed ‘Mr. Timbit’ and ‘Timmy’ passed away from congestive heart failure. It was a terrible shock. Timbit also died alone in his favourite chair — his ‘perch’ in the living room that was his window on the world. A couple of months earlier, the little guy had been around to Dr. Melanie’s clinic to have some teeth removed and another check-up. All was normal. No sign of heart problems. Another check-up with the good doctor and another get-together. Click to enlarge. Timbit — his body still warm but his eyes fixed, staring into space — was rushed to an emergency vet clinic. Pacing anxiously in the parking lot was Dr. Melanie. She flung open the car door, took one look at her old friend, grabbed him by the scruff of his neck and dashed into the clinic. “Jesus,” she said. A long ten minutes later, Dr. Melanie walked solemnly into a private meeting room, head down, tears streaming down her face, holding a lifeless Timbit wrapped in a blanket. She didn’t say a word. She didn’t have to. Here’s the notice that went up on a mailbox in Timbit’s neighbourhood. Neighbours soon appeared at the door with condolence cards and flowers. The little guy was not only well-known but well-loved. A psychic once told me that pets are here to show us love. I get it. The day after Timbit ‘crossed over,’ a pair of wild rabbits scurried about the yard, running from the front to the back and to the front again. Back and forth they went. They hadn’t done that before. And several robins — which hadn’t been seen until then — were perched on the deck railing. That was odd too. It was as though the wildlife sensed Timbit was no longer on this plane and they were paying their respects. Somehow they knew. Just like Doctor Melanie knew. 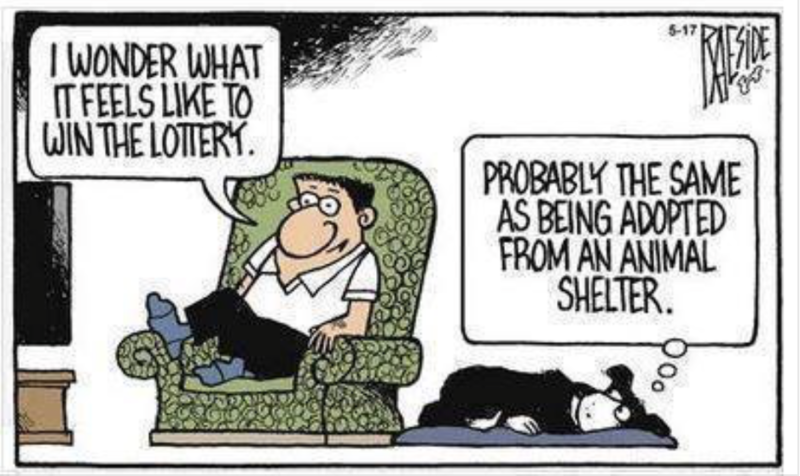 Courtesy of cartoonist Adrian Raeside of the Victoria Times Colonist and The Big Mutt Blog. Click to enlarge. You gave little Timbit a home and so much love. He was family. He returned your care with unconditional love, loyalty and gratitude. Another great read, thank you. Now, Byron, you can see why I do what I do … it’s a Godsend. I know you can really form a bond with your pets and it really leaves an empty spot when they are gone. From them waking you to go out and be fed in the morning and just being there with you during the day. A great story. A wonderful dog with an awesome personality that brought joy to others. I have a picture of Timbit on my fridge and it cheers me up. A nice send-off for Timbit. A touching and sensitive portrayal of one dog’s plight … among the many. A nice piece of heart tugging … and the wonderful rescue. 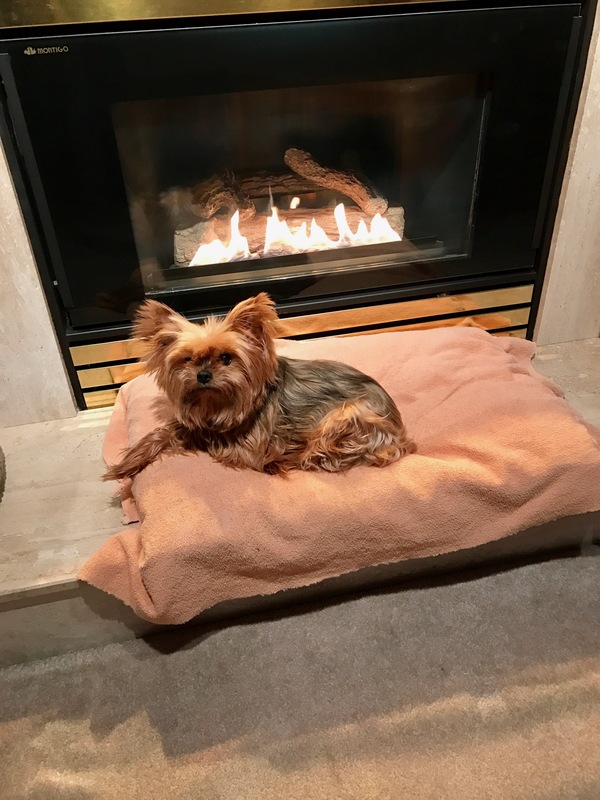 I loved this story … about an adorable little dog with a big personality! Touching story. You’ll be missed Timbit! A beautiful story of Timbit! Love, patience, caring and faith coming together. Thanks Dr. Melanie for following your heart! Timbit was a lucky dog and so was his owner. This is a great story about a little dog and people with a huge heart. Your story on Timbit made me cry. It is not fair he left so quickly. The foxhole photo got me, as did the happy dance. Nice piece, shorter than most … and what a climax. Never saw that coming. Also a nice change for you away from the harsh world of crime and punishment stories. Dang, I wasn’t expecting this ending but what a wonderful story. Timbit certainly rolled up the rim to win a double-double. First finding Dr. Melanie and then his forever home. He experienced more love and happiness in his last four and a half years than any goodness in his previous life. I have held two precious dogs as they took their final breaths, I dread the day my third dog makes the same trip. Beautifully written with such heartfelt emotion. Never easy to say goodbye to our fur babies.